This is a great stock up price on drinks for lunchboxes. 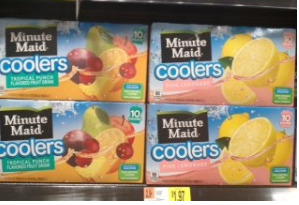 Minute Maid Coolers 10pks are priced at $1.97 each at Walmart. Use this $1.00/1 Minute Maid Juice Box 10pk coupon so score these for just $.97 each.